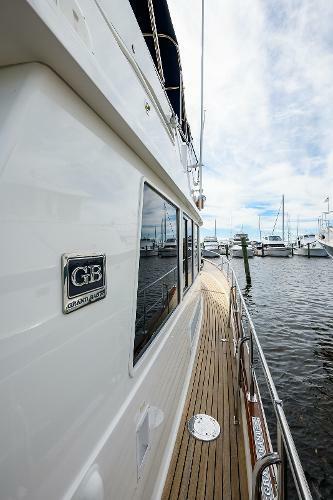 The Classic layout is time honored and the most popular design Grand Banks has ever built. This updated version offers two suites fore and aft with ensuite heads for privacy and island queens in both! The galley is mid-level with a large pantry and granite counters. 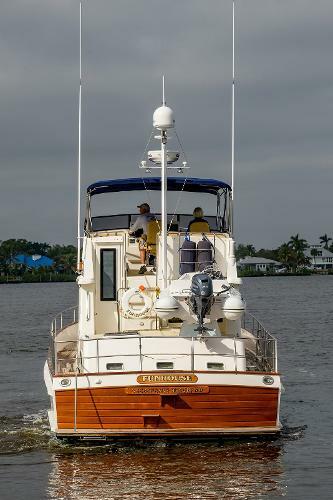 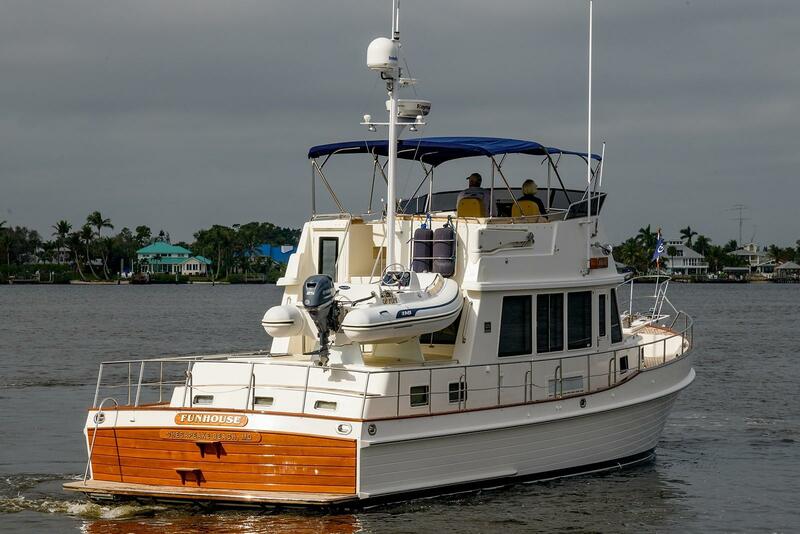 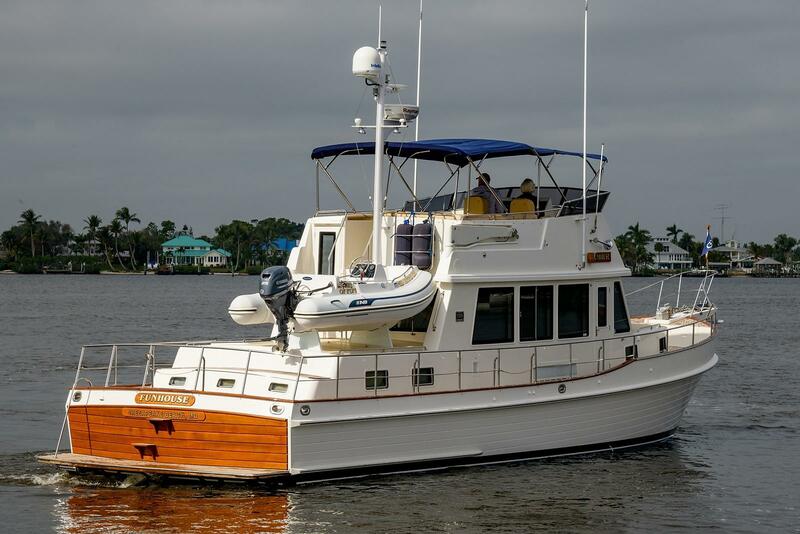 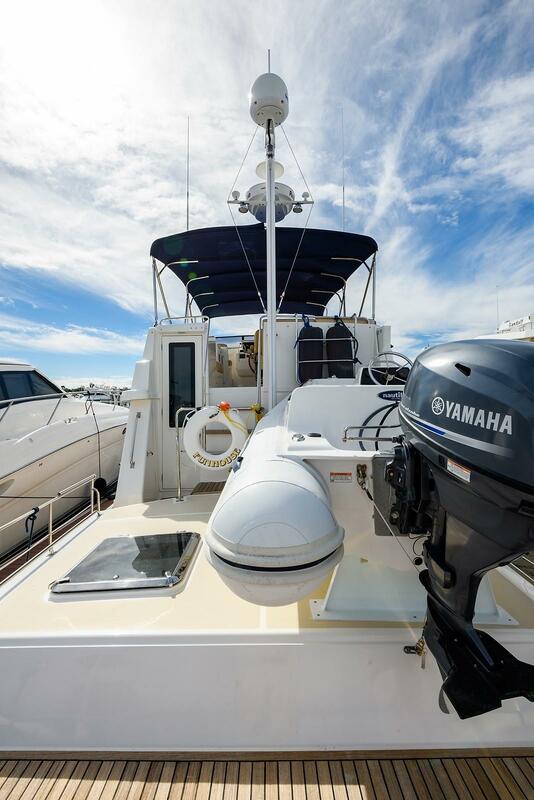 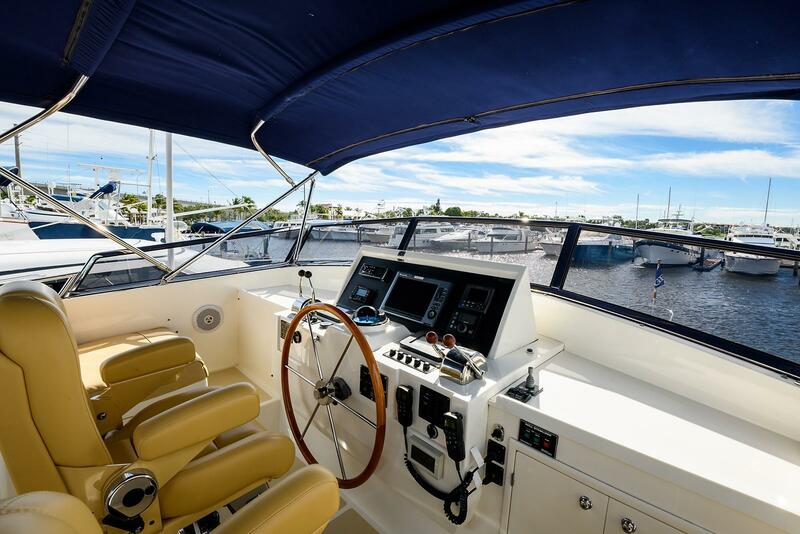 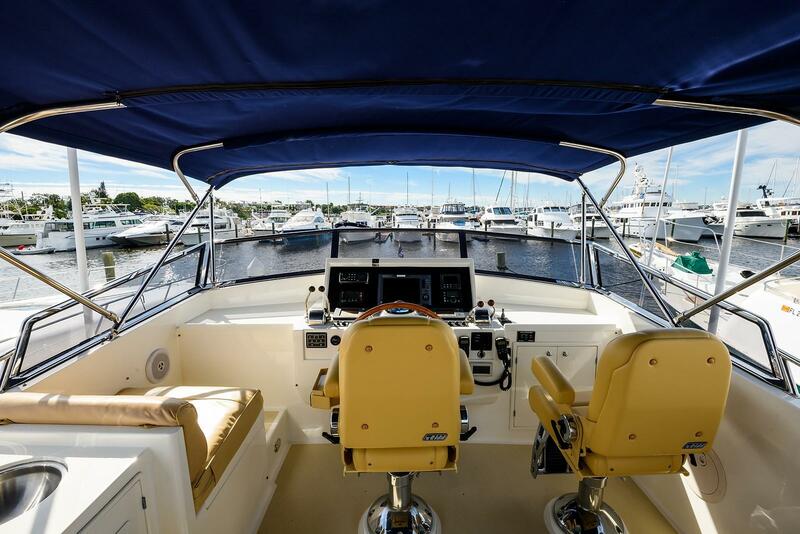 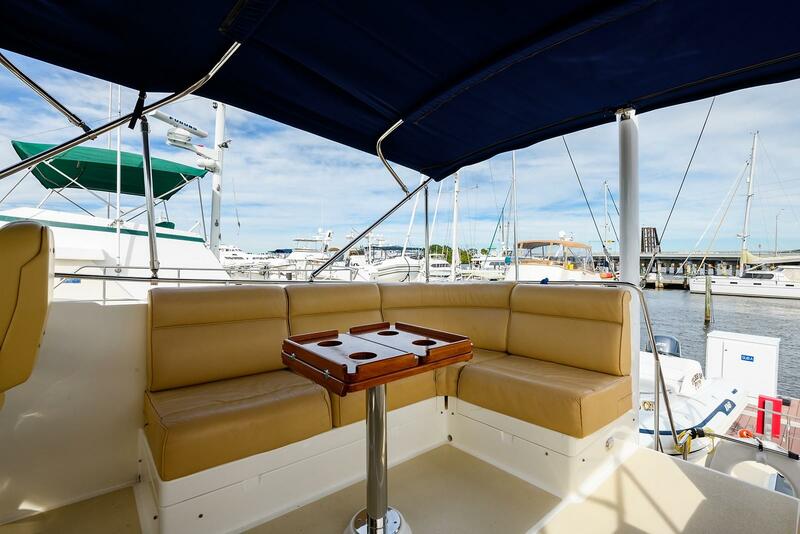 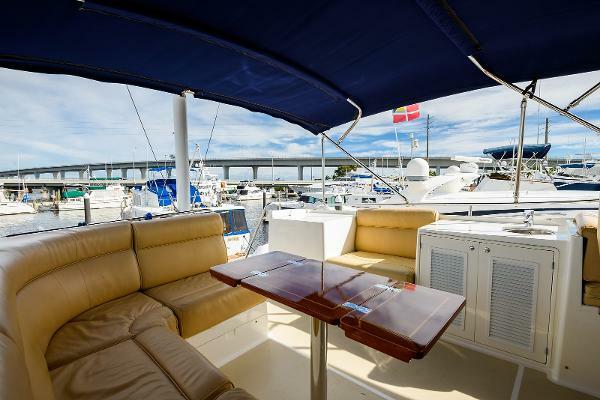 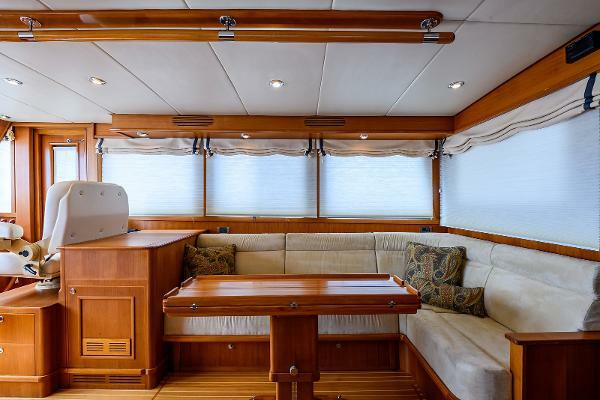 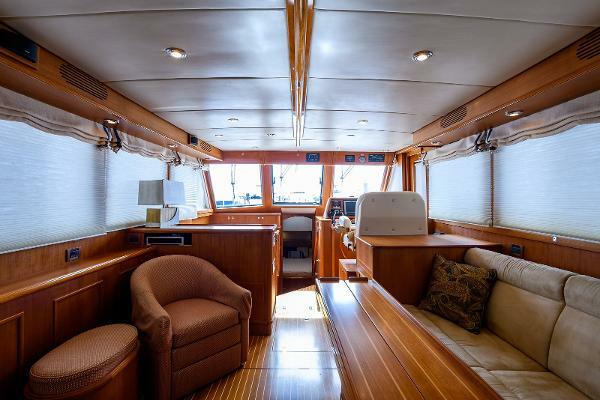 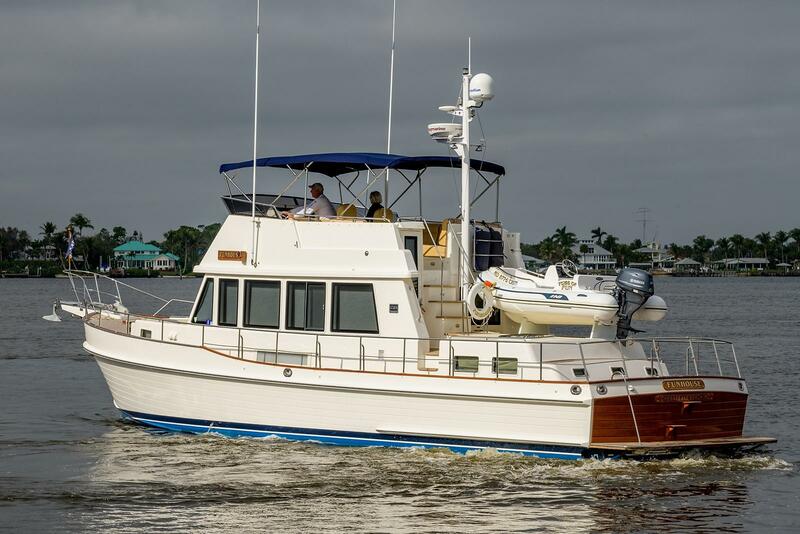 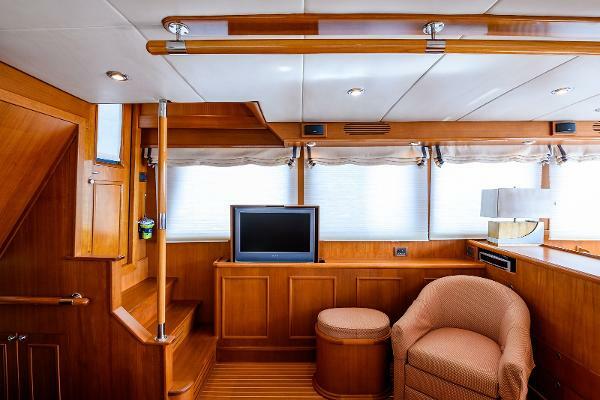 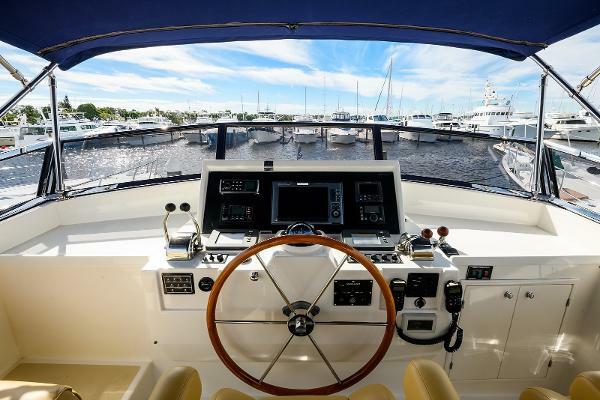 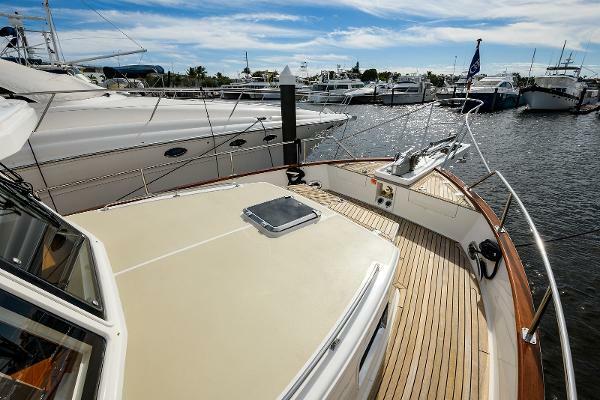 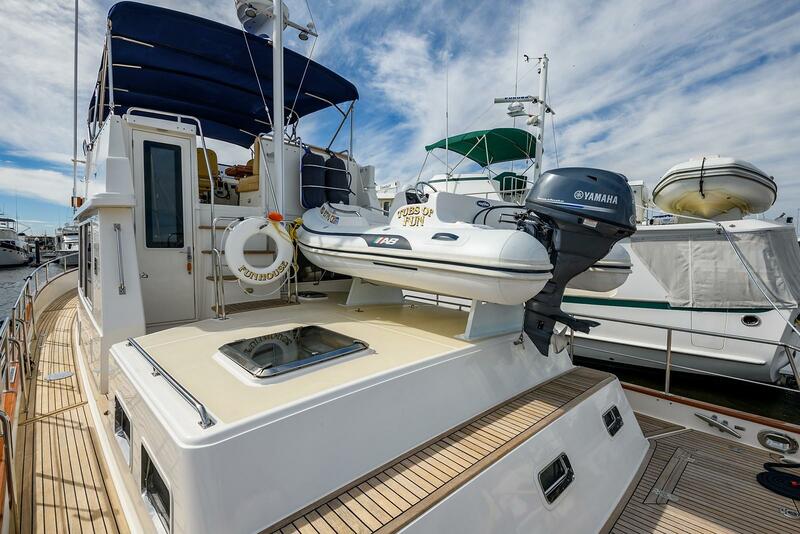 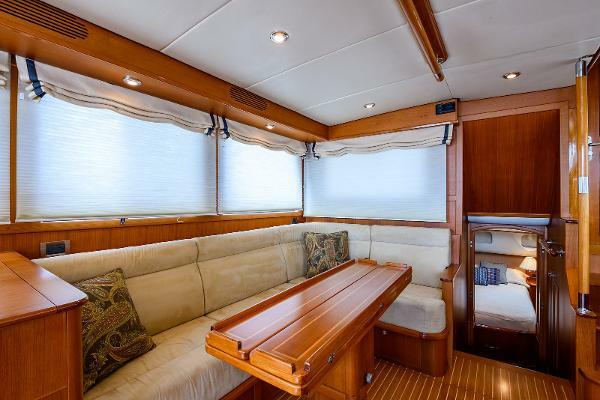 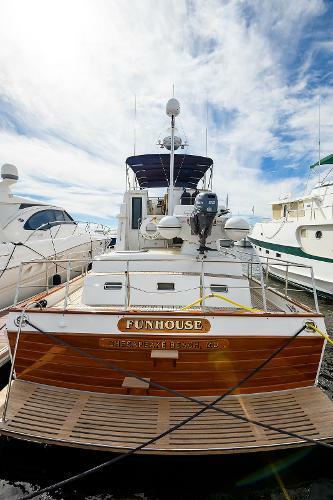 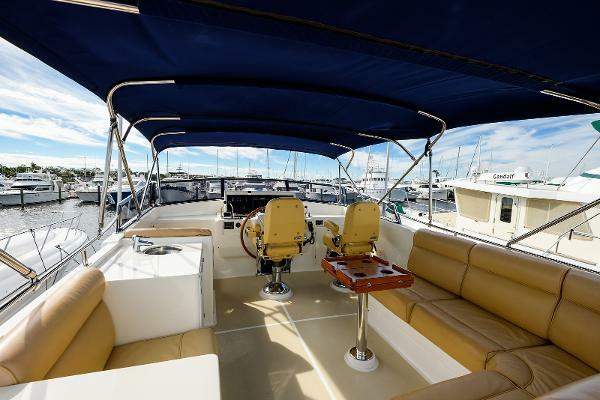 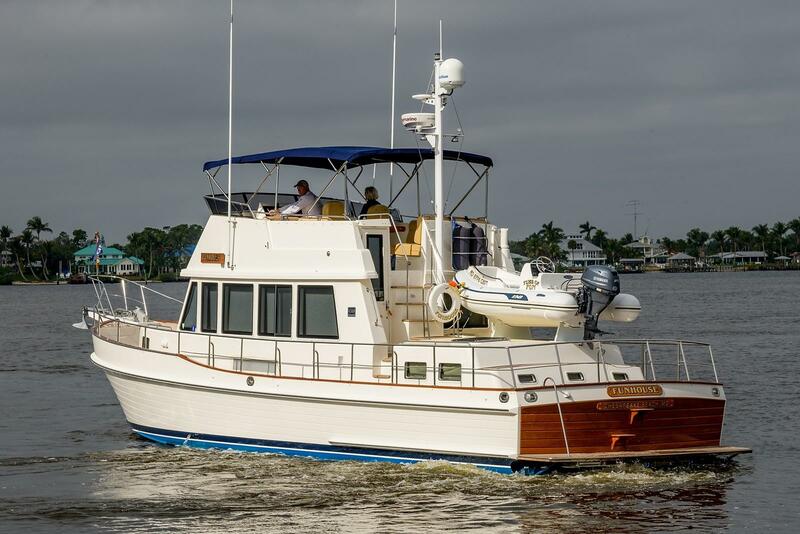 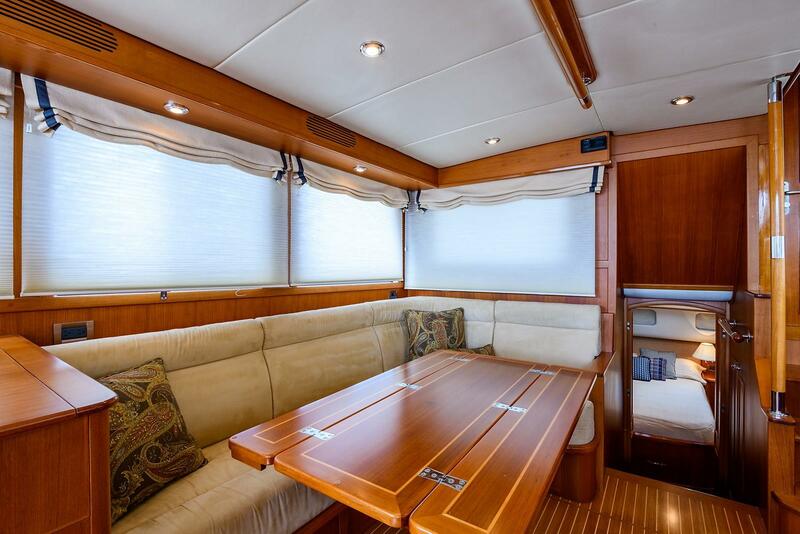 The flybridge is generous and has STIDD chairs, large corner settee, sink and refrigerator. The Sparkman & Stephens planing hull cruises at 20 knots and tops out around 25. 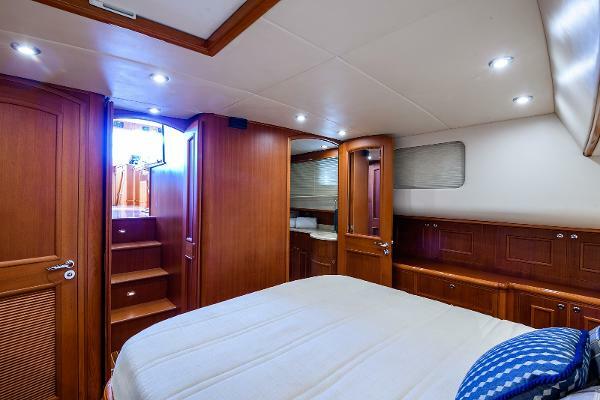 Many prefer the Classic layout over the Europa as master and guest cabins are at either end of the boat and not bunched together. 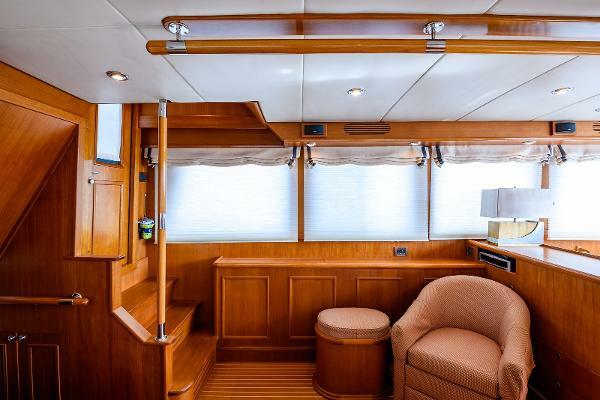 The Classic also has more interior living space than a Europa thus making the Classic ideal for cruising, living aboard or enjoying dockside. 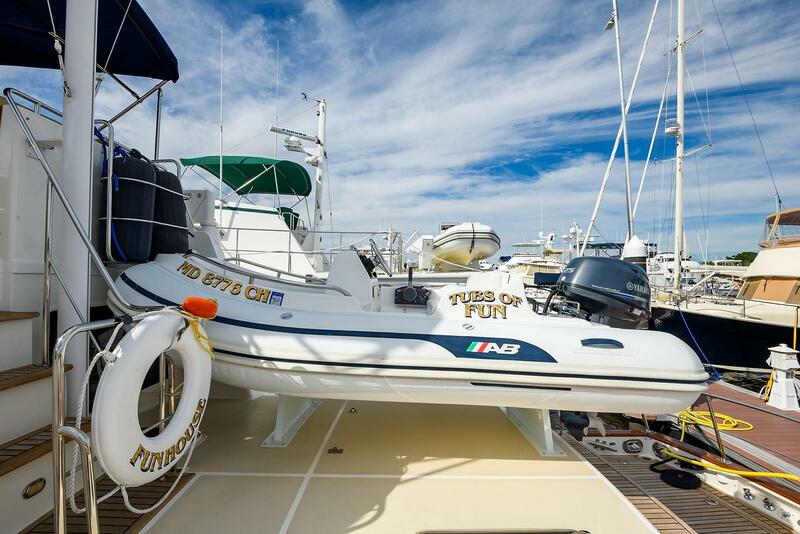 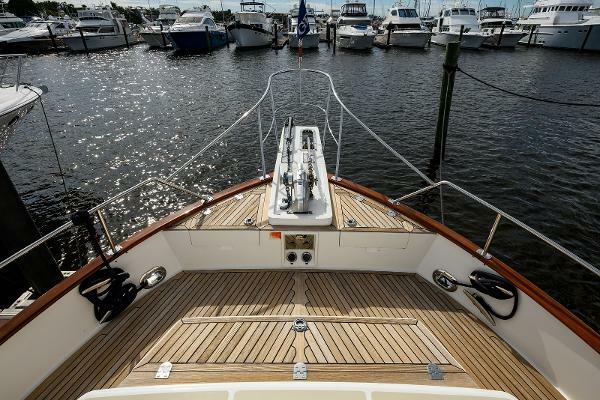 She is TURN KEY and ready to begin cruising with new owners! 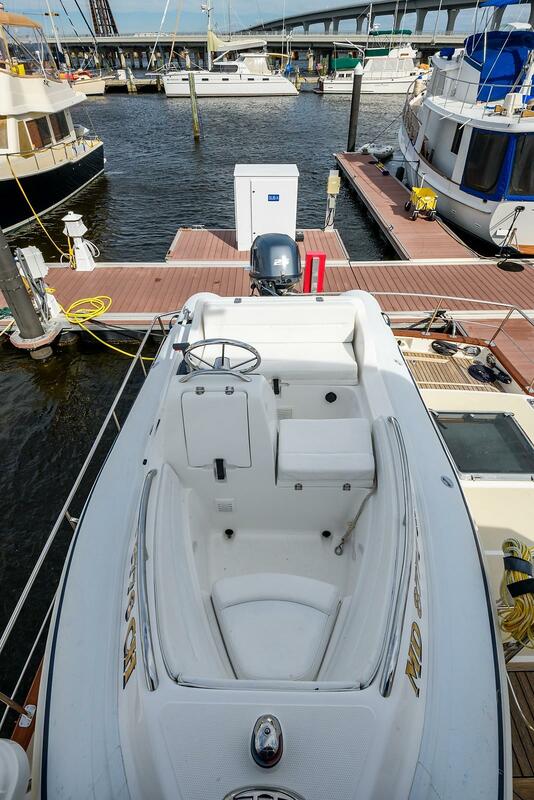 The entrance door is aft on Port outboard side, into the salon. 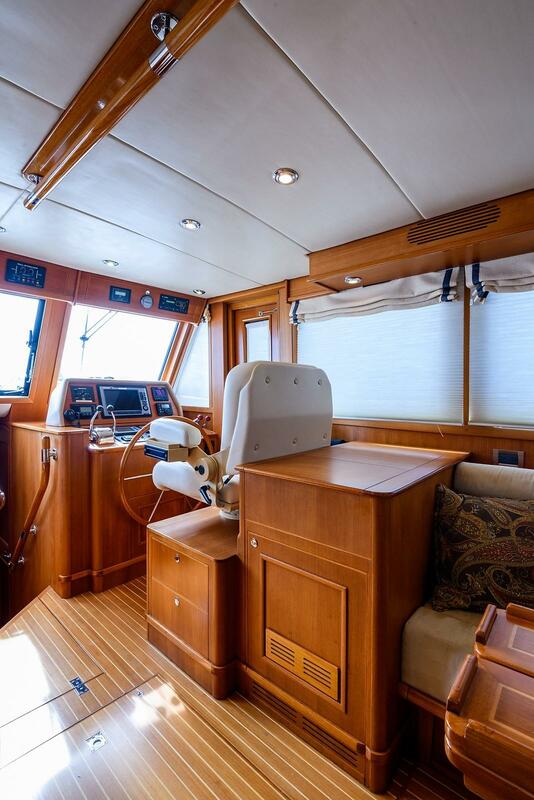 A large L-settee is on starboard and comfortable barrel chair with ottoman is on port. There is an extendable high/low dining/coffee table inboard of the settee. 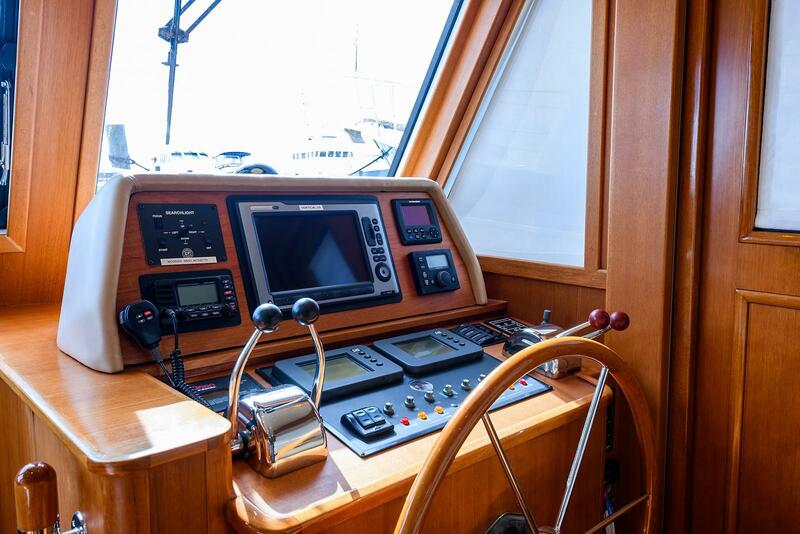 The lower helm is opposite the galley. 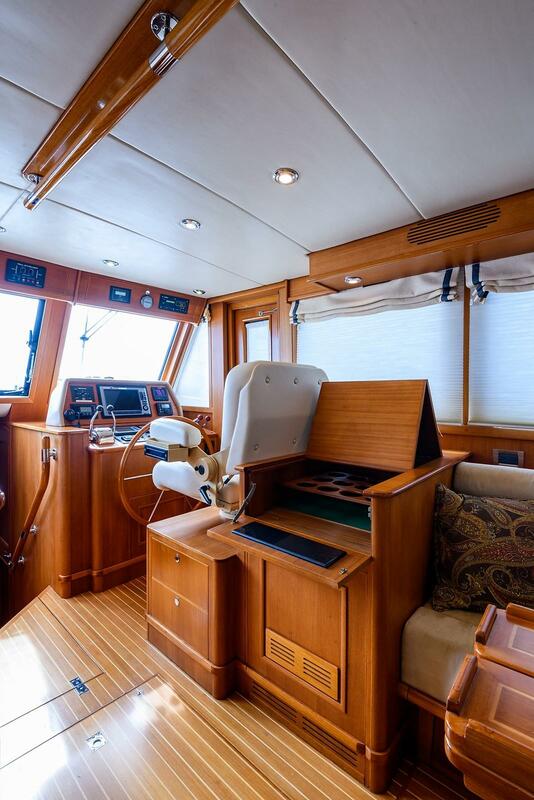 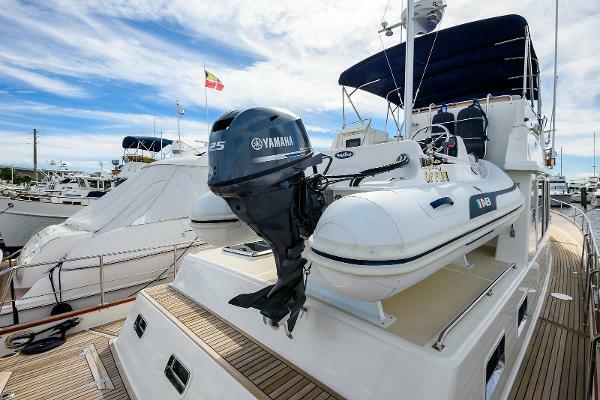 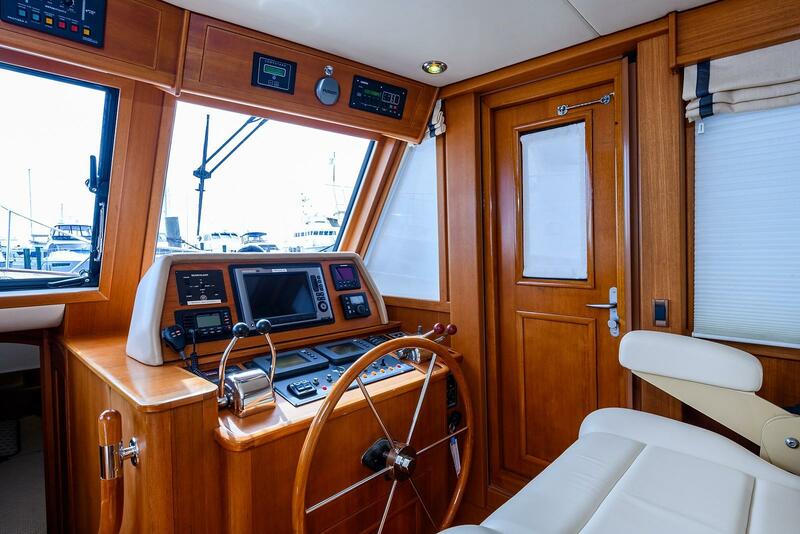 The helm area offers a helm side door, oversized single STIDD seat, and an electronics Himalaya that allows all electronics to be flush mounted. 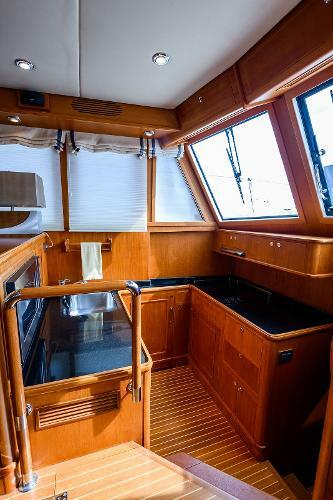 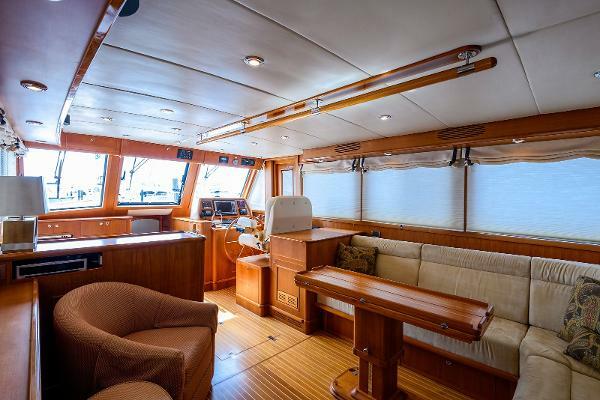 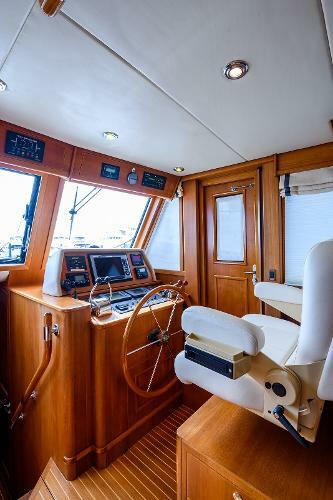 The galley is on port at mid-level, two steps lower than the salon and two steps higher than the forward companionway. 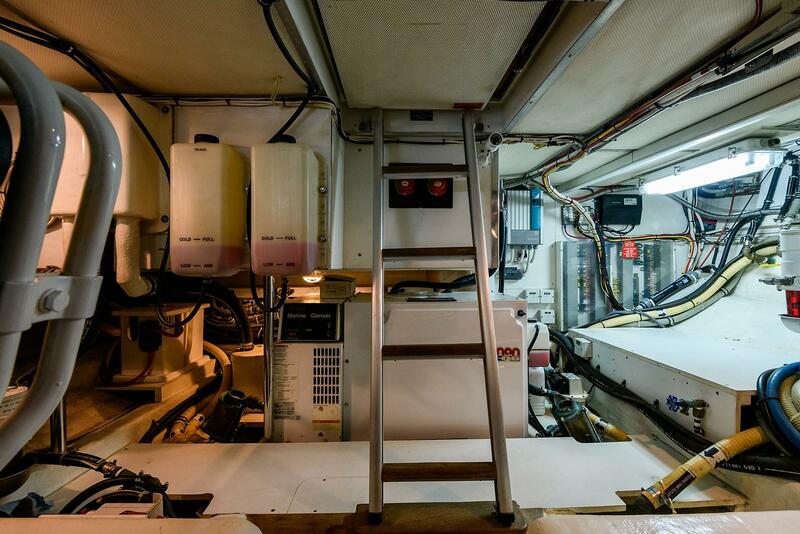 The galley is very smartly laid out. It is U-shaped and offers a microwave, undercounter Subzero refrigerator, and a stand up under-counter freezer. 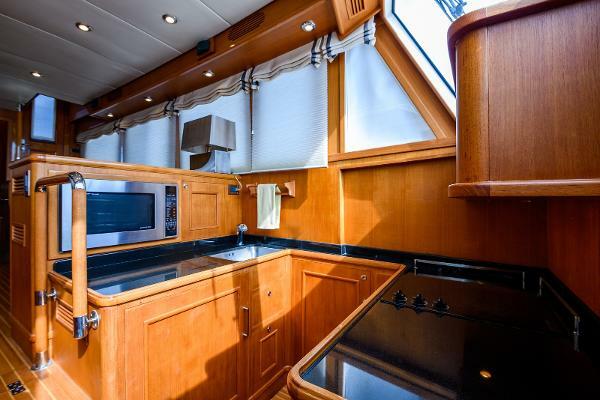 There is a Ceran glass cooktop and granite counters. 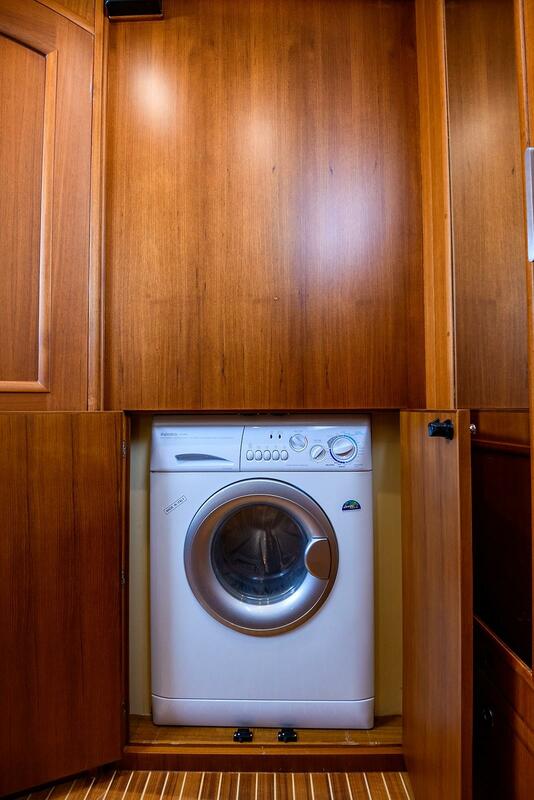 A large pantry opens for additional storage. 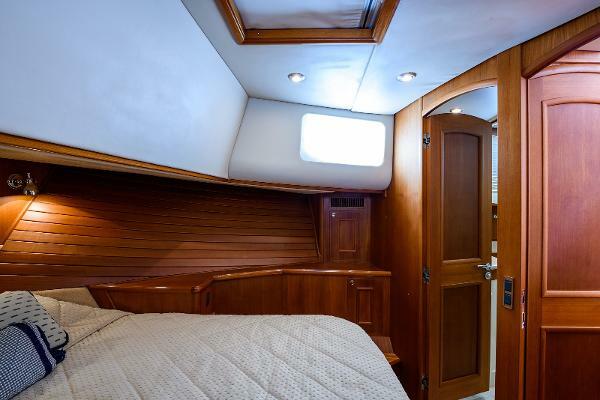 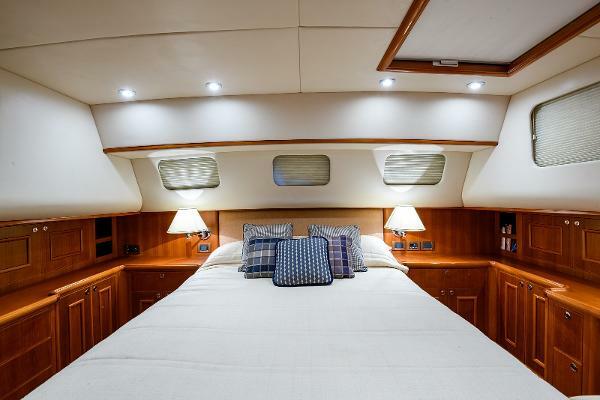 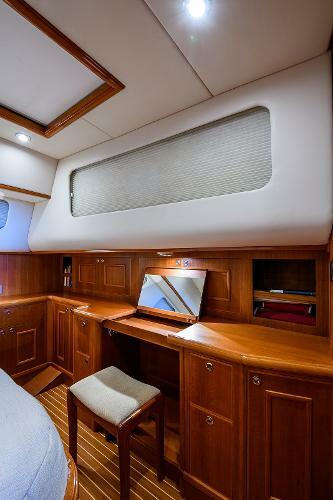 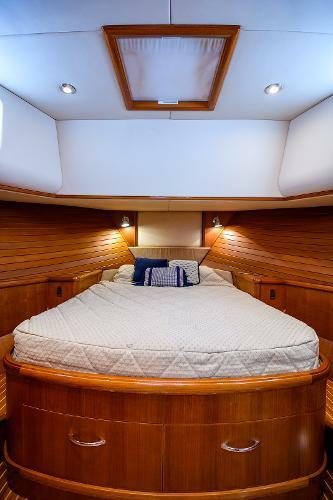 The forward stateroom has an island queen berth, full size hanging locker, and a combination washer/dryer that is flush mounted in the aft bulkhead with teak access doors. 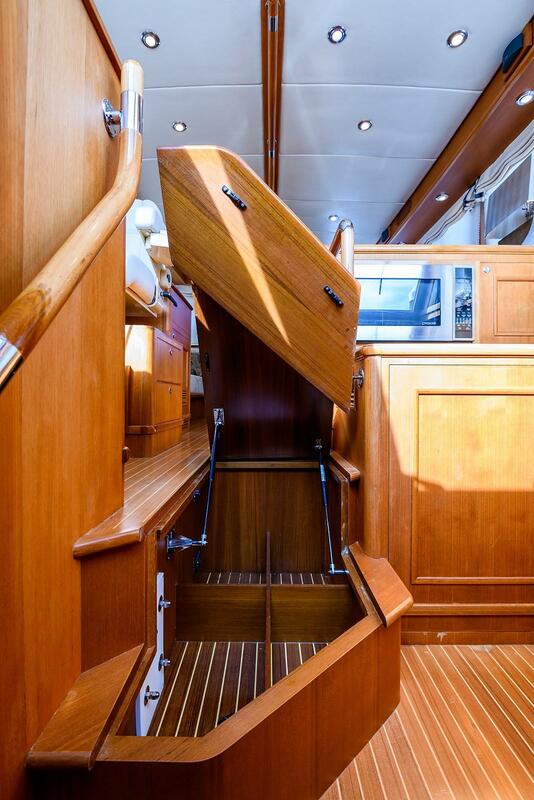 There is abundant storage. 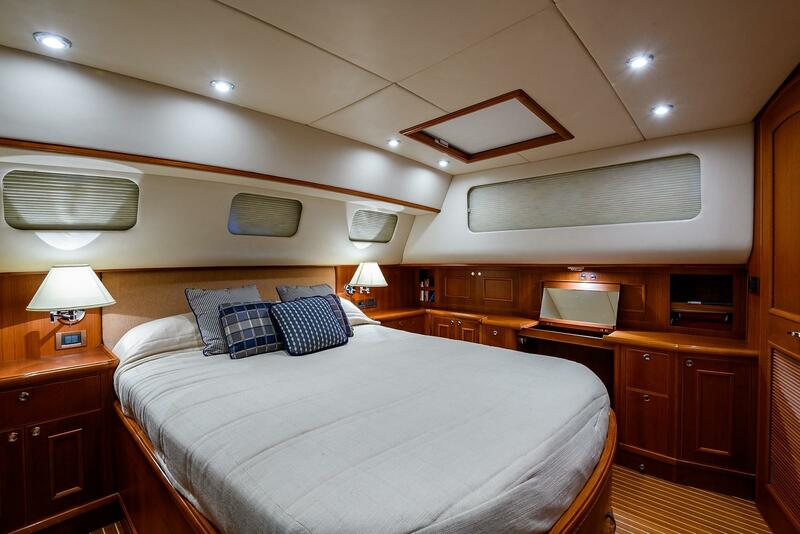 The forward guest head offers two doors and can function as ensuite or day head. 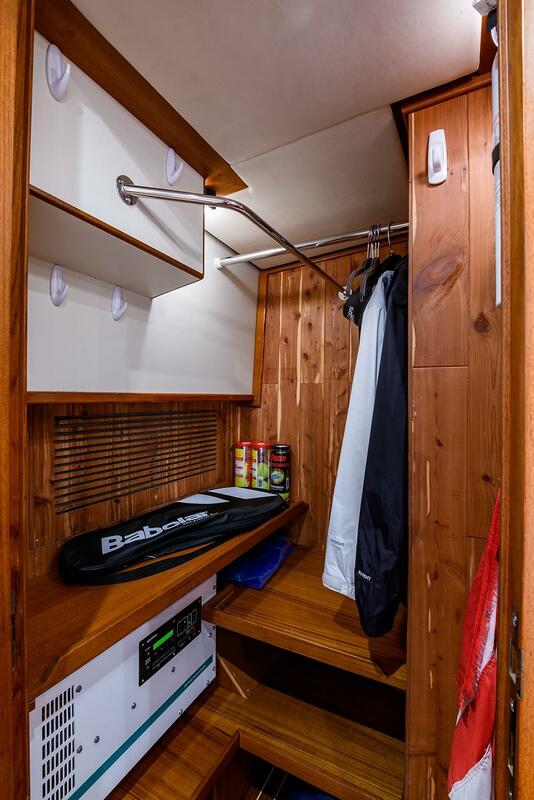 There is a very cleverly designed fold-out shower that when extended, offers plenty of elbow room and keeps the rest of the head dry. With these shower doors folded and locked against the side and aft bulkhead, it greatly enlarges the guest head. 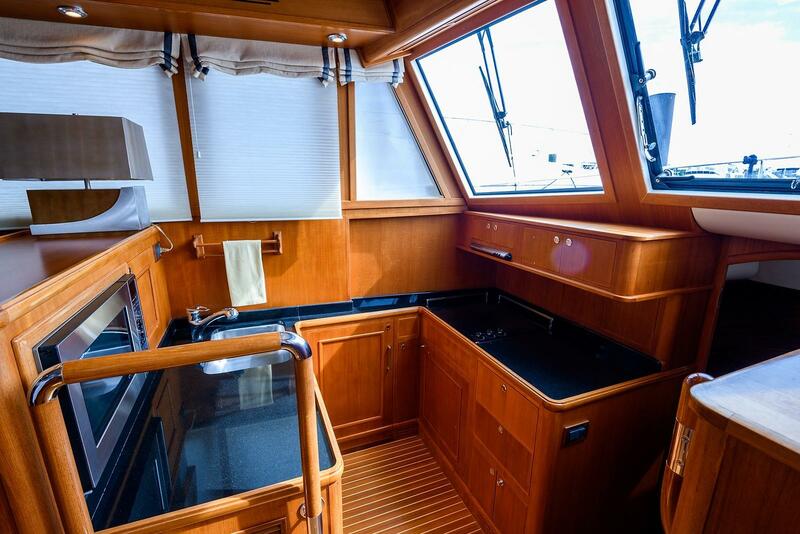 The interior cabinetry is like fine teak furniture featuring a satin finish with gloss trim highlighting it. 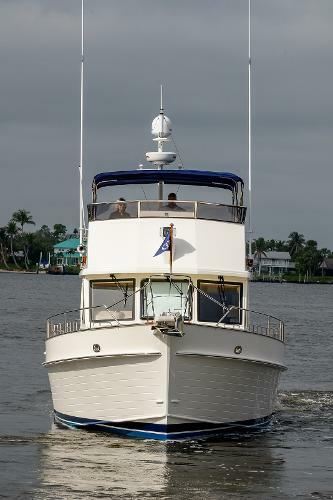 The hardware is stainless steel and heavy duty. 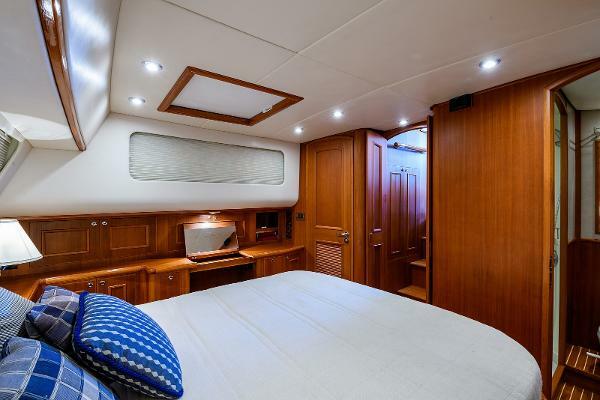 The aft master cabin is large and spacious. 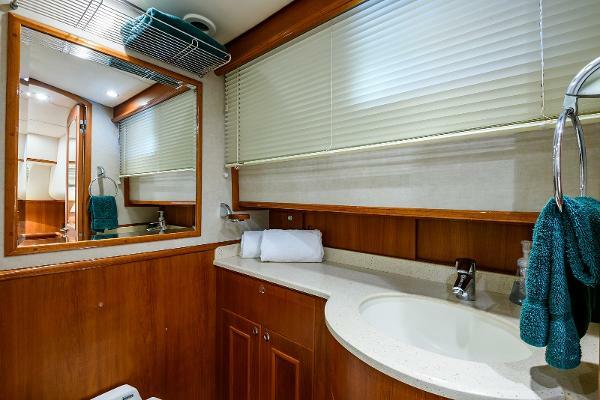 It offers a queen full walk-around berth, walk-in hanging locker, mirrored vanity with stool for make-up, tons of storage cabinets and drawers. 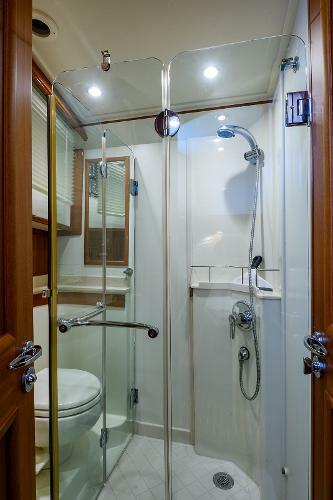 The ensuite master head has a very large separate stall shower and a NON-LEAKING heavy shower door. 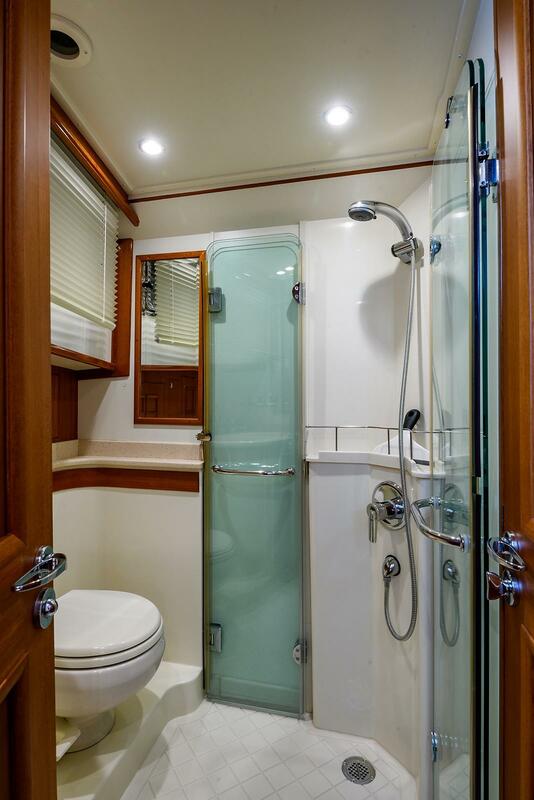 The shower enclosure and sole is Corian for easy up-keep. The interior also features courtesy lights, teak and holly soles, window shades, custom fabrics and recessed lighting. 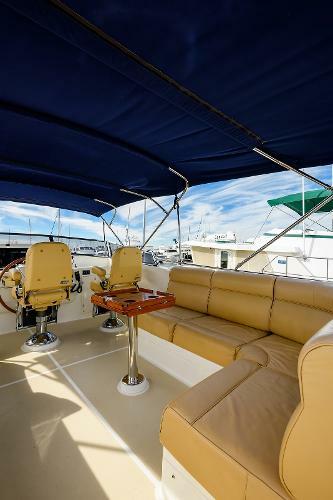 The salon is very inviting and offers a large L-Settee, TV, barrel chair and built-in entertainment systems. Air-conditioning in teak overhead soffits w/ (7) reading lights on dimmer. Air-conditioning blows to salon left - not straight down onto the furniture. 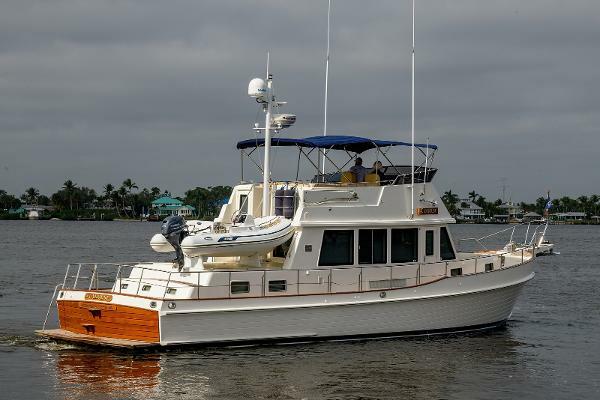 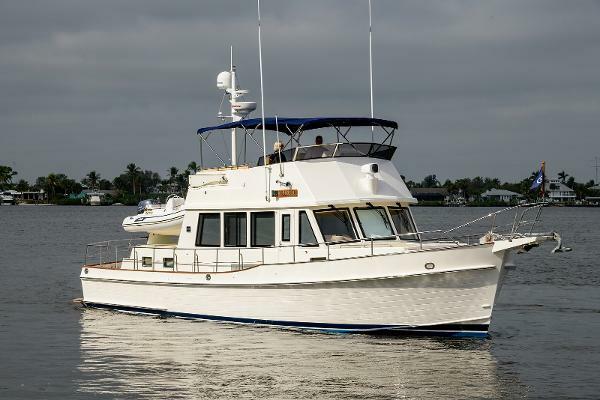 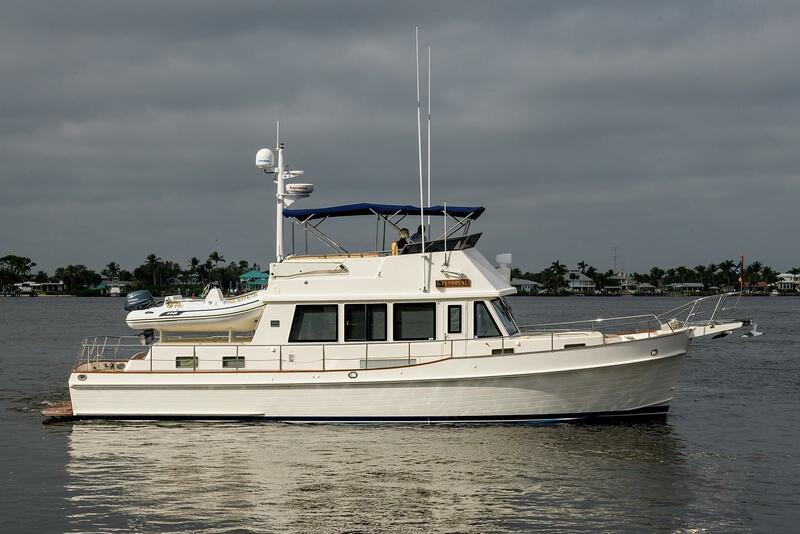 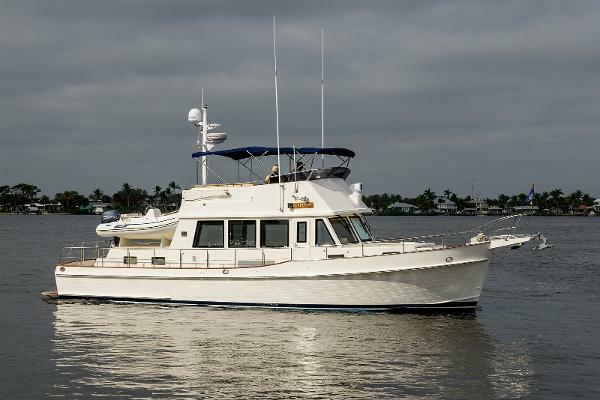 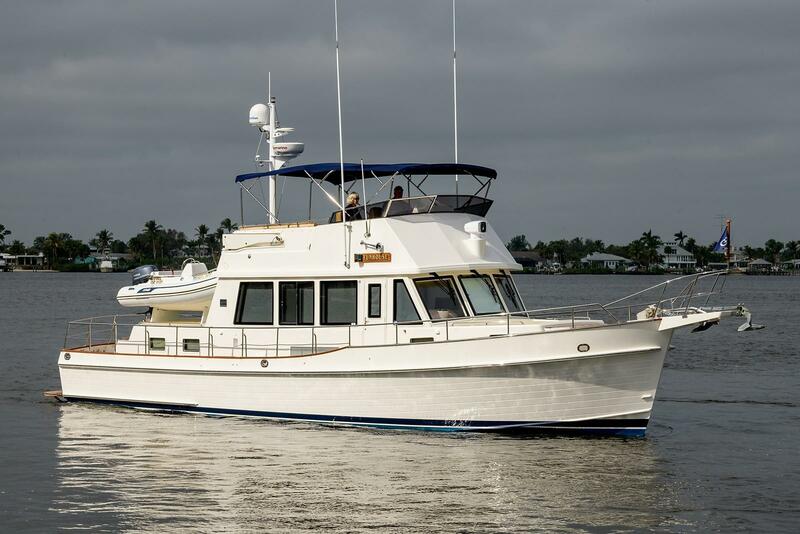 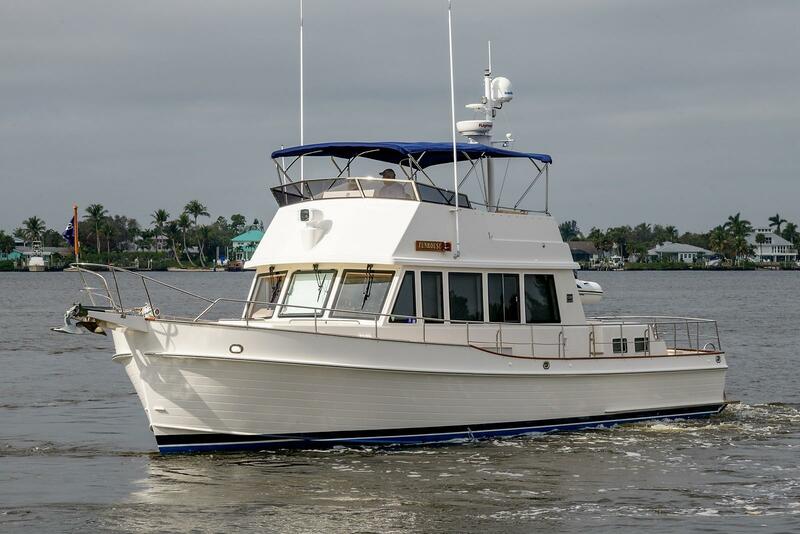 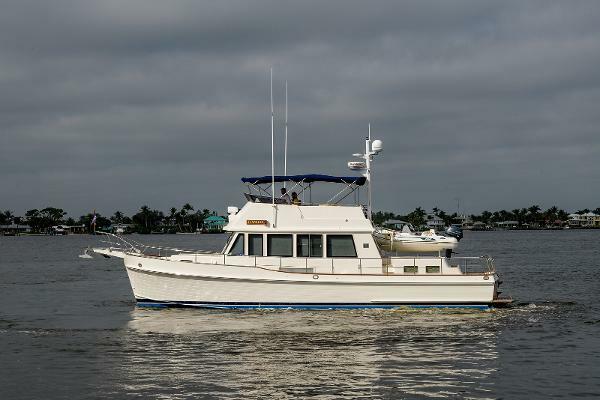 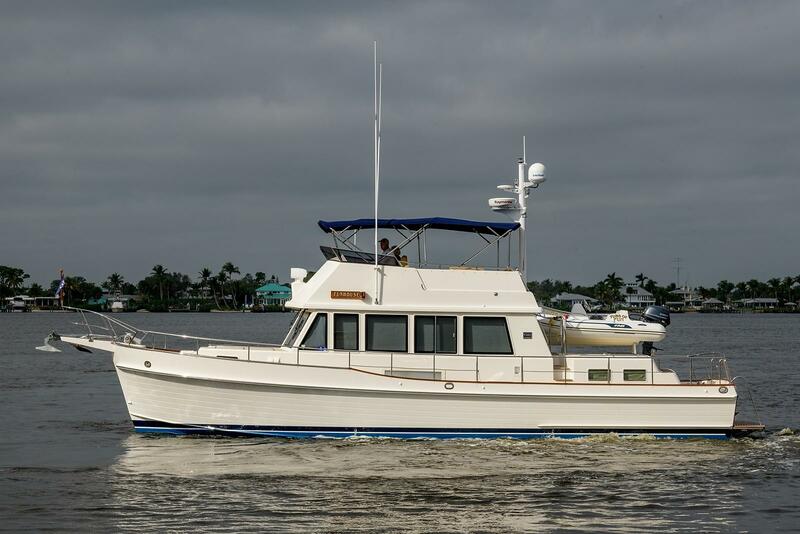 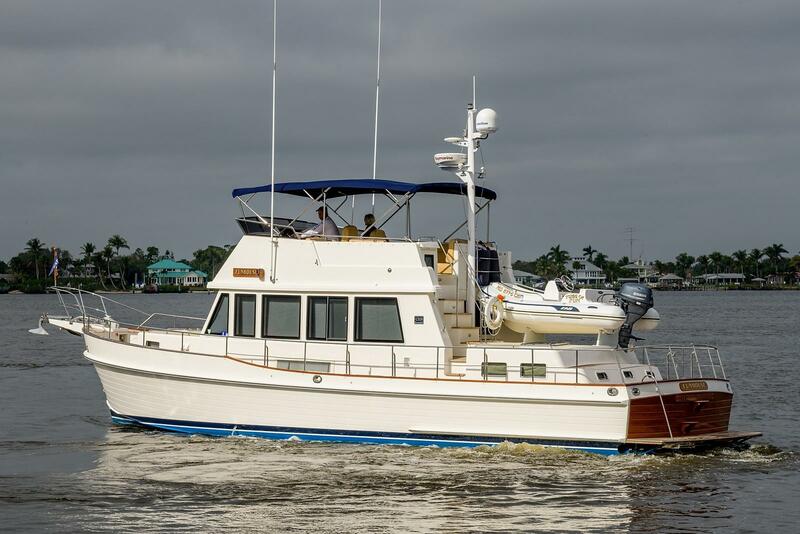 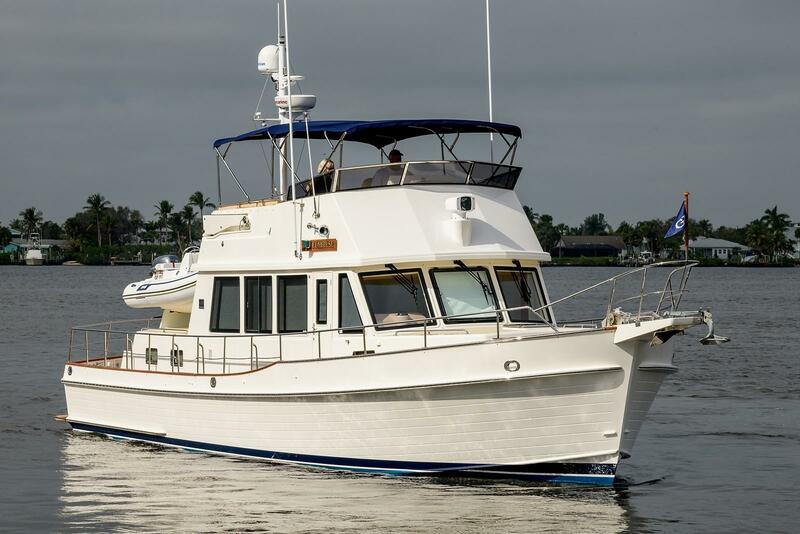 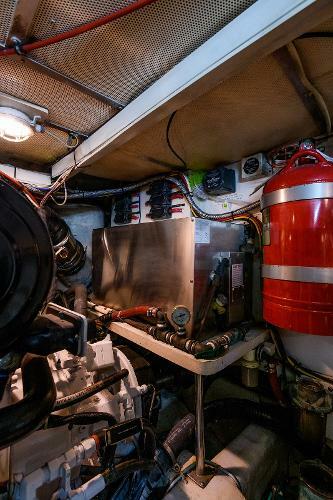 The mid-level galley is large and u-shaped with plenty of overhead and undercounter storage. There is a large compartmentalized pantry, easily accessed under the first step. The companionway to the Aft Stateroom, gives you easy access to the ships electrical panel. 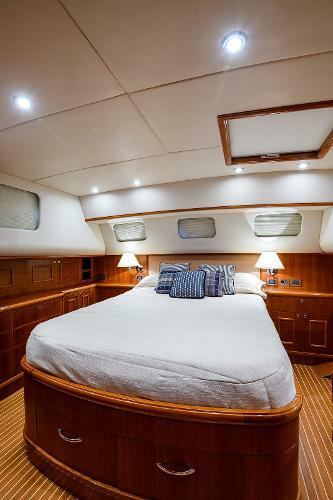 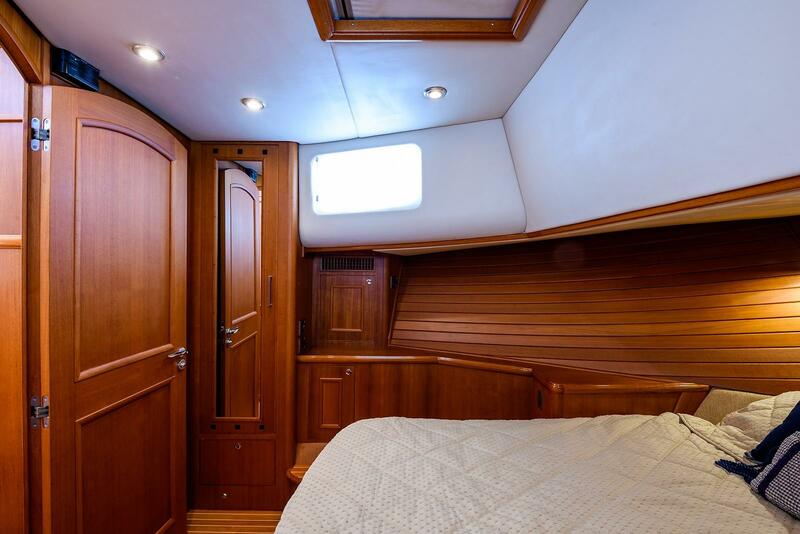 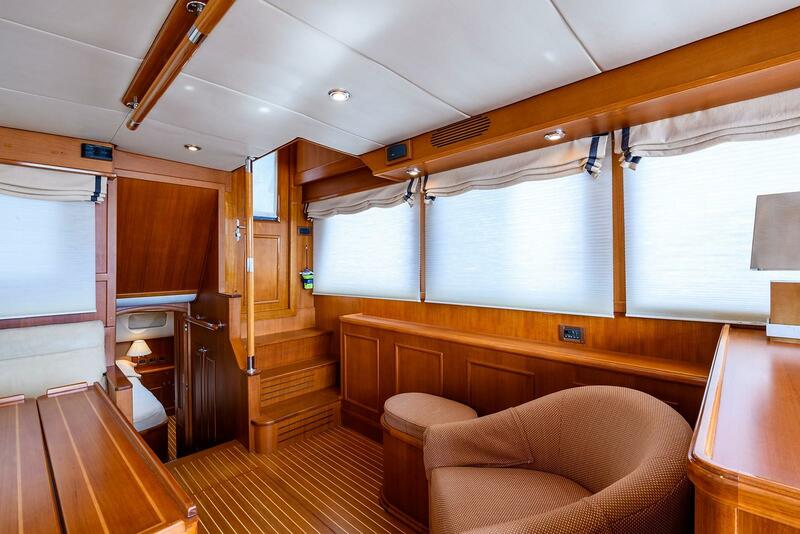 The large master stateroom, offers full privacy behind two closing double teak doors. It's like being in your own private world, once the doors are closed. The master head in ensuite with a large separate stall shower. 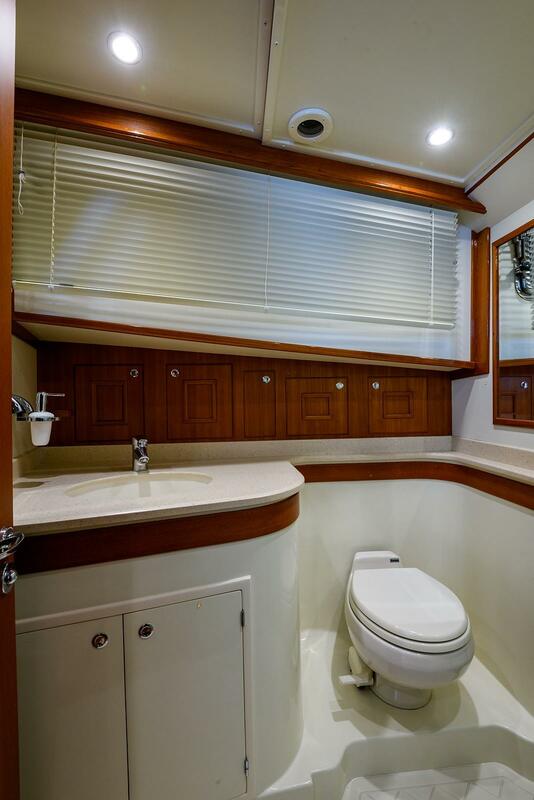 The master head is sizable with Silestone counter, storage behind and under the vanity and opening hatch and port window for ventilation. 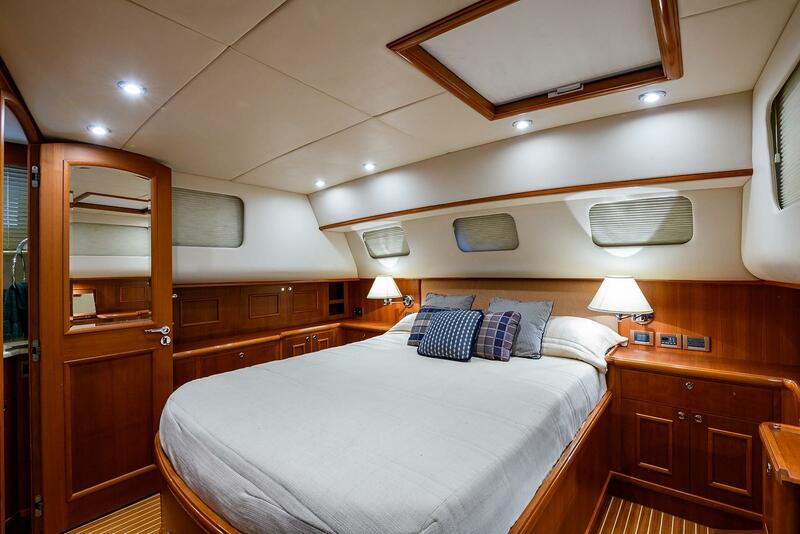 The Guest Stateroom suite is forward with a queen island berth and ensuite head. 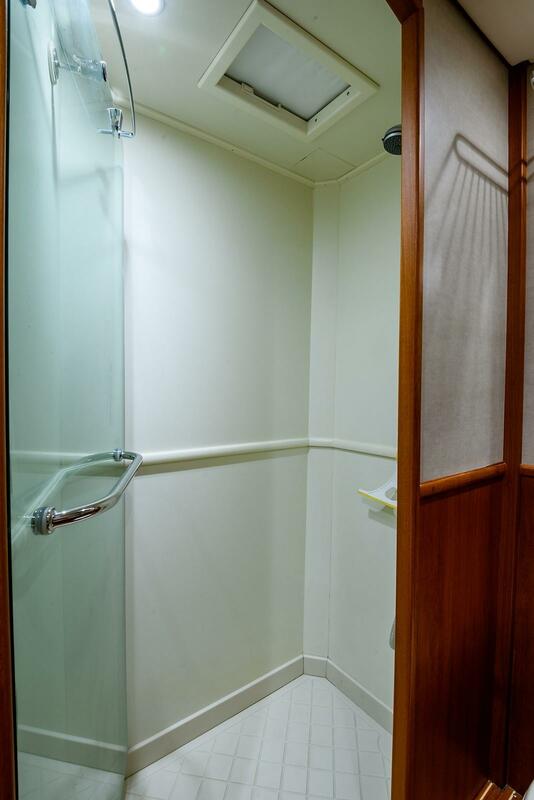 There is a door for complete privacy. 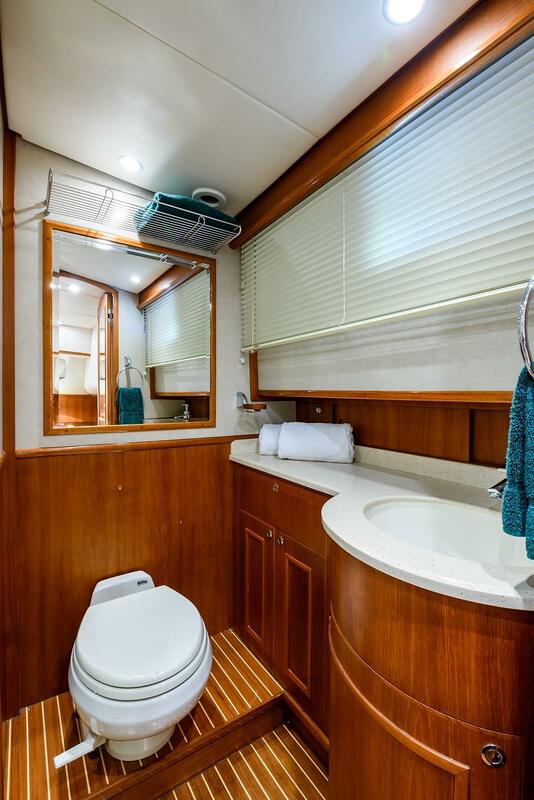 The ensuite guest head is much larger than most as the shower glass panels fold flat, leaving a larger dressing area. Expandable glass shower with heavy glass panels that fold flat when not needed. Expands into large shower. 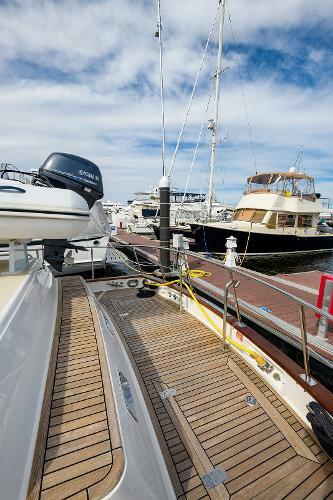 The teak decks surround the house offering a firm footing when decks are wet and a classic, nautical look. 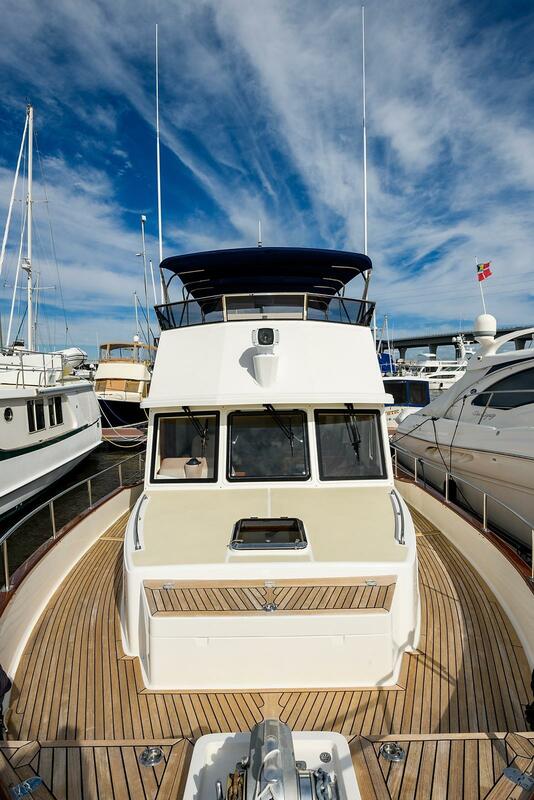 The flybridge is large and fully under cover. 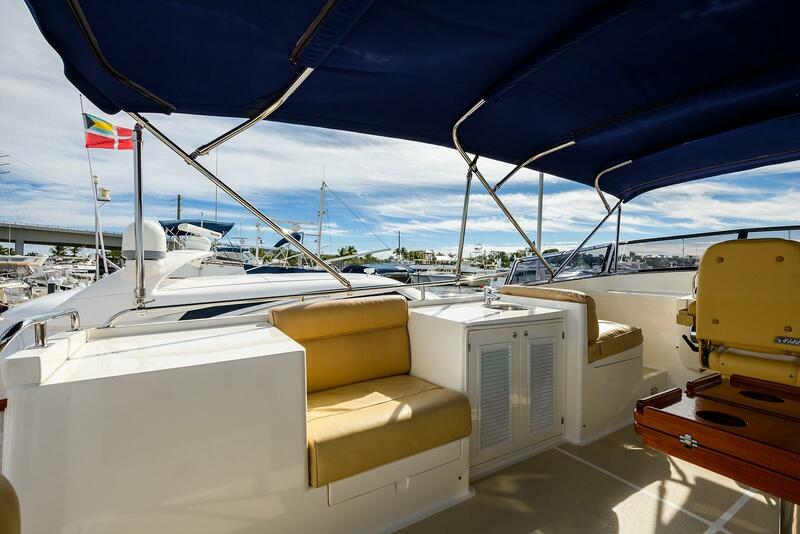 Two helm STIDD chairs are extremely comfortable and fully adjustable. 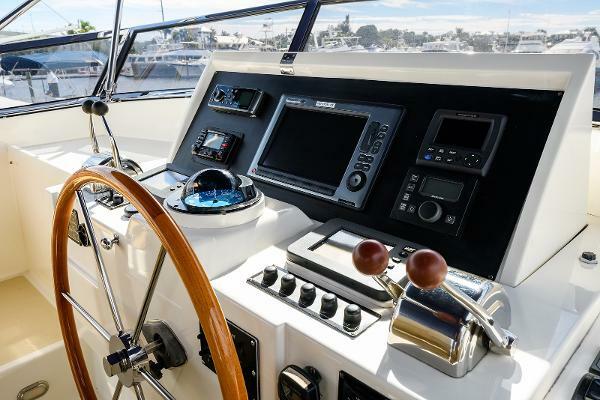 A perfect spot while underway or enjoying a soft breeze with a drink while anchored or at the dock. 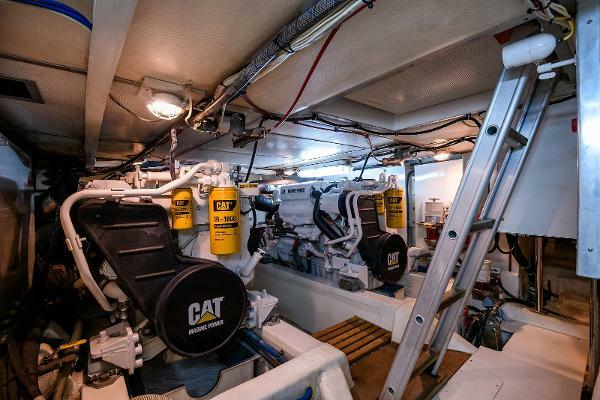 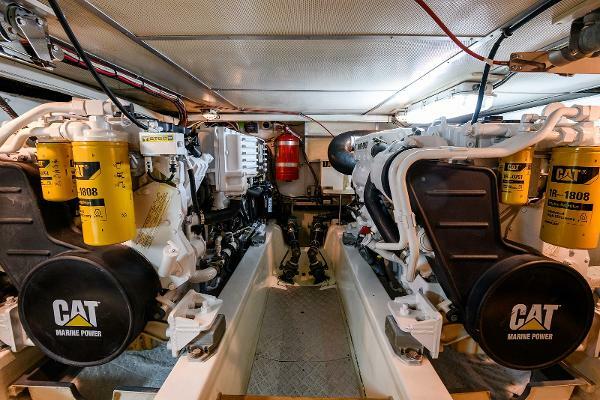 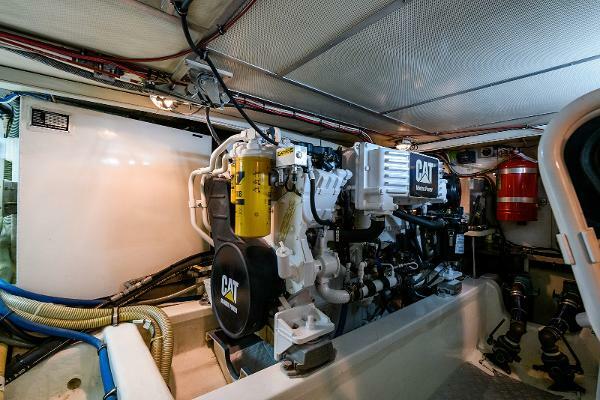 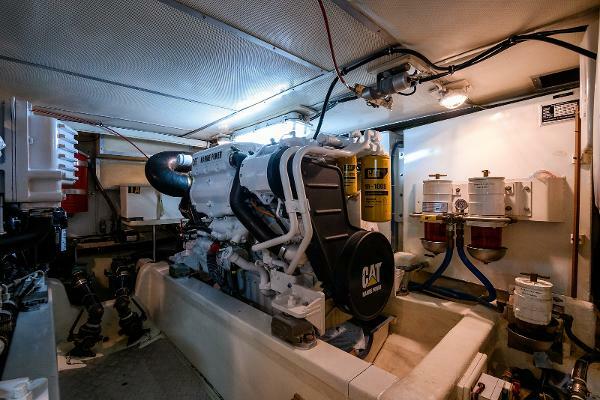 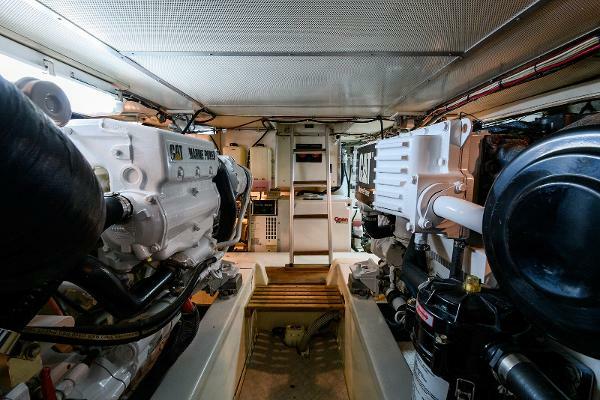 The engine room has CAT engines with 2,465 hours, they have had both the 1,000 and 2,000 hour preventative engine maintenance. Oil, filters and impellers were changed 2/18 on both maines and generator. Fun House has been gone over from stem to stern, including engines and generator. She is ready for her next owner.